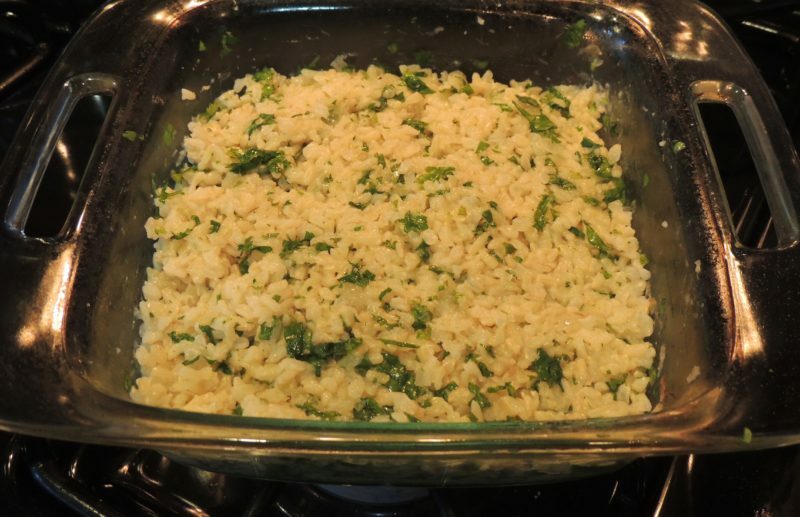 Here’s an easy way to dress up brown rice, and free up the stovetop if needed. This dish can also be prepared ahead of time then reheated to serve, making it a good dinner party dish. 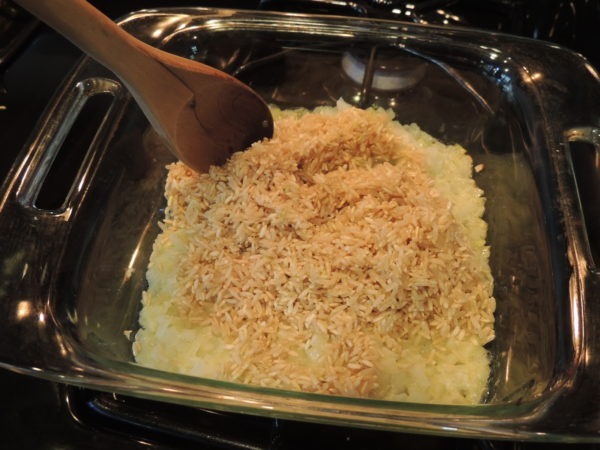 Use 2 cups liquid if you like firmer rice, or 2-1/4 cups for a softer consistency. We sometimes add fresh herbs from the garden in addition to, or in place of, the cilantro. 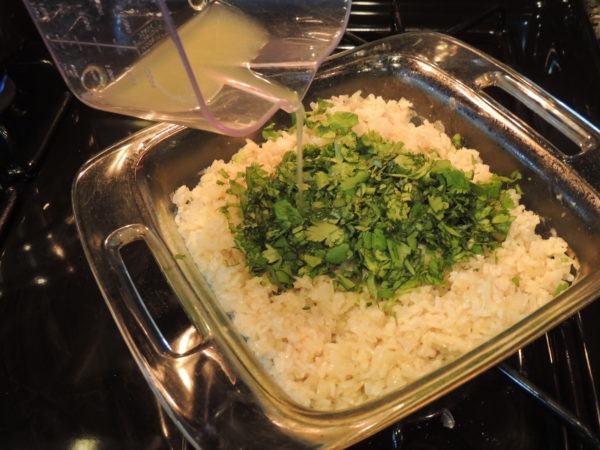 Chives or tarragon are nice substitutions for the cilantro, but reduce the amount to 1/4 cup. If adding strong-tasting herbs like oregano, thyme, or rosemary, use 1 to 2 tablespoons. 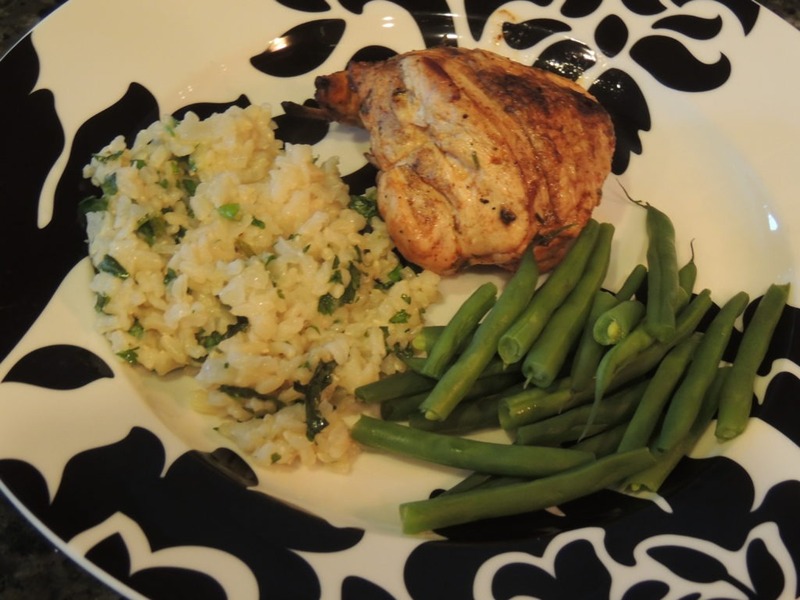 Try this jazzed up rice dish as a nice side to roast chicken or simple pan-sautéed fish. Place butter in an 8x8-inch baking dish, and melt in oven as it preheats. Rinse brown rice in a colander to remove residue of toxins like arsenic, found naturally in rice. Set colander in the sink to drain while you continue. Finely chop onion, checking on butter often. Once melted, add chopped onion, stir, and return to heating oven for a few minutes. Watch carefully, so butter does not burn. While onion is in oven, bring water or broth to a boil in a small saucepan over high heat. Alternatively, pour into a 16-ounce (or larger), microwave-safe liquid measuring cup or bowl. Heat in the microwave on high until boiling, about 3 minutes. 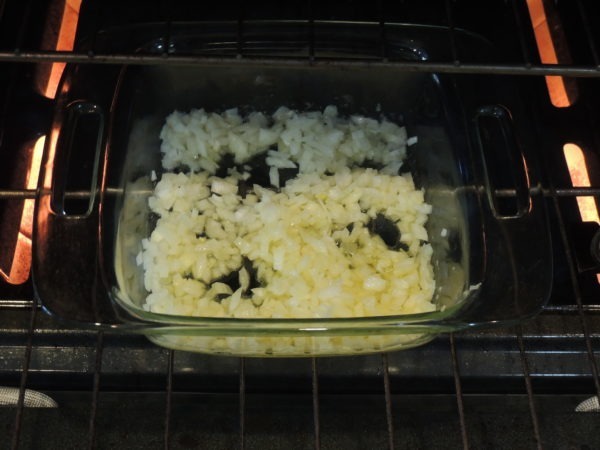 When onion is fragrant and soft, remove from oven and add rice. Pour boiling liquid over the rice mixture and gently stir. Add salt if using water, not broth. Cover baking dish with a lid if it has one, or tightly wrap with 1 to 2 layers of foil. Bake 1 hour. Remove from oven and uncover. Let stand for about 5 minutes while you chop the cilantro. Add cilantro and juice from half of the lime. Fluff with a fork to combine ingredients. Add juice from remaining half of lime if desired. Baked Lemon-Parsley Rice– Substitute lemon for the lime and parsley for the cilantro.